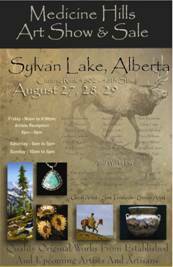 Sylvan Lake will be hosting some spectacular artists at the annual Medicine Hills Art Show & Sale. A wealth of artists will be in attendance, including Calgary Stampede art and artisan exhibitors Henri DeGroot, Andrew Kiss, Doug Levitt, Michele Zarb and bronze artists Clyde “Ross” Morgan and Sam Terakedis, just to name a few. Hosted by local artist Wanda Whaley, the three-day show and sale brings collector and museum quality western art to the relaxed lakeside resort town. what are the times for the 3 day show at the Sylvan show and sale? Newspaper article is kinda iffy. Thank you. M.
Jeez, you’re right Marlene – it needed more info. I’m going to repost this again as it’s coming up asap.